The signs were there, but the weather wound up holding back just a bit. So much for the Ice Bowl II-coldest NFL game ever talk. 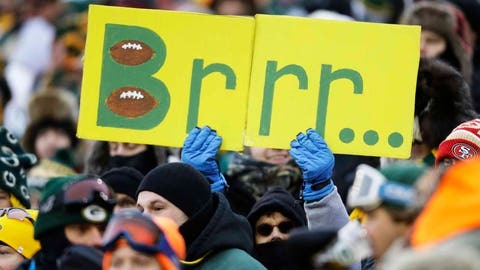 Despite all the hype ahead of the Wild-Card game between the Green Bay Packers and San Francisco 49ers at Lambeau Field, the temperature at kickoff was 5 degrees, with a wind chill of minus-10. Yes, that’s extremely cold. It’s just not NFL record cold. As a matter of fact, it doesn’t even crack the top 10. The NFL bases its record on the temperature at kickoff, regardless of change afterward. For comparison’s sake, the infamous "Ice Bowl" — the 1967 NFL Championship between the Packers and the Dallas Cowboys — was -13 at kickoff with a -48 wind chill. No. 10 on the list, a Dec. 22, 1990 game between the Packers and Detroit Lions, also at Lambeau, was 2 degrees at kickoff. In all, four of the top 10 coldest games were at Lambeau Field. Colin Kaepernick, the quarterback who guided the 49ers to a 23-20 win, clearly wasn’t bothered, going sleeveless and declining to wear gloves. "I’ve played in cold-weather games before. I feel like it’s more mental than anything," said Kaepernick.